There are specific varieties of apples that work best in baking a pie. 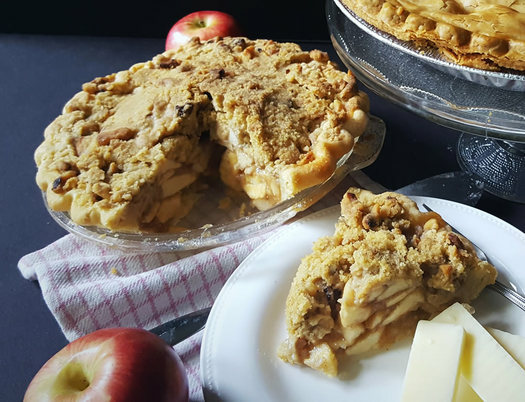 Forget the super-sweet kind that we love to eat right from the tree (Gala, Red Delicious, Fuji, Pink Lady) as they tend to become mealy and mushy in the pie. Instead, go for something tart and firm. 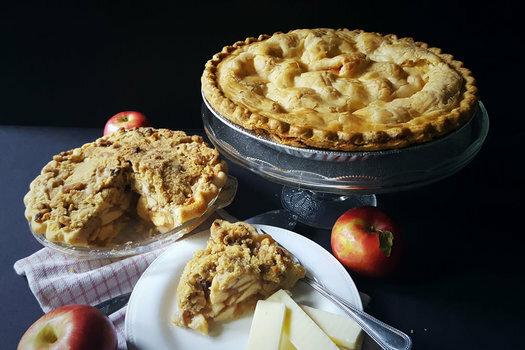 Golden Delicious are the perfect apple for pie because of the sweet-to-tart ratio in the flavor and the high pectin content, which helps the filling "set" properly (not get too runny). Pippin, Northern Spy, Cortland, Empire, and MacIntosh all work well in pie. Avoid green apples, which tend to be too tart and tough. Slicing the apples too thick will result in a runny pie filling, but slicing too thin will give you mush. Aim for about 1/4-inch. An all-butter crust sounds appealing, but pulling one off requires deft skill. A lard crust will give you unbelievable flakiness, but can lead to a tough texture. So try using a combination of butter and unflavored vegetable shortening, which gives you the best flaky and tender crust. There's a lot of food science that goes into a making good pie, but the number one thing to remember is this: Keep everything cold when making your crust. You don't need to refrigerate your flour and shortening like some recipes would have you do, but you want to make sure your water and butter are very cold and that you allow the dough to chill before rolling it out. You could even refrigerate the pie for 30 minutes before baking. 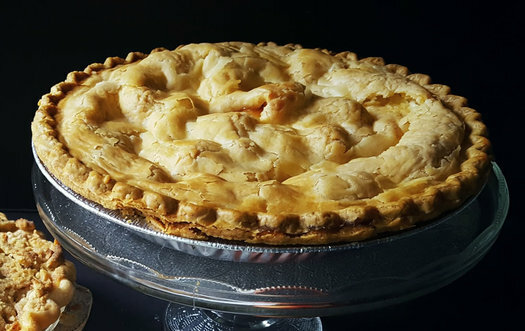 A cold pie is a flaky pie, and it will also help the crimp on the crust keep its shape. I use instant or "minute" tapioca for a thickener in my pies because unlike flour and cornstarch, tapioca does not have to be "cooked through" in order to remove any raw taste. If you can't find instant tapioca (though most grocery stores carry the Kraft "Minute" brand in the red box near the pudding and jello mixes), substitute 2 tablespoons of cornstarch and be sure to mix it throughout the filling well so there are no gummy pockets of cornstarch. When making the dough, the best tool to know if you have the right consistency is your hand. After cutting in the fat (that is, mixing the chunks in with the flour), squeeze a handful of dough. It should just hold together but still crumble easier when poked. Squeeze it again after adding water. There will be a few crumbs in the bottom of the bowl, but it should not be overly sticky. Dough that is too wet leads to a flat, soggy crust. Pie is a great metaphor for life. Sometimes to get to the good stuff, you have to take a step back and wait a minute, let things temper. If you try to cut into a pie right after it is baked, the filling doesn't have time to set and you'll have a pie that falls apart and is runny. Plan to pull the pie from the oven at least three hours before you intend to eat it. Better yet, make it the day before. Makes one double-crust pie (top crust and bottom crust). Can be made a day in advance. In a food processor, combine dry ingredients with butter and shortening. Pulse to incorporate butter and shortening until the dough resembles sand and peas. Slowly add water, 1 tablespoon at a time (do not add ice! ), and pulse until the dough just comes together in a slightly pliable but not sticky ball. (This might take less than 6 tablespoons, or more than 9... many factors come into play here. Be sure to add water until just combined). Divide dough into two balls, wrap each in plastic wrap, and refrigerate for at least an hour. In a bowl, combine the dry ingredients and whisk to combine. Cut in the butter and shortening with a pastry cutter until the dough resembles sand and peas. Slowly add water (do not add ice! ), one tablespoon at a time, and blend together until the dough comes together in a slightly pliable but not sticky ball. (This might take less than 6 tablespoons, or more than 9... many factors come into play here. Be sure to add water until just combined.) Divide dough into two balls, wrap each with plastic wrap, and refrigerate for at least an hour. Preheat the oven to 400 degrees Fahrenheit. On a well-floured surface, roll half of the pie dough into a 12-inch circle and carefully transfer to a 9-inch pie plate. Dust the bottom of the pie crust with two tablespoons of white sugar. In a bowl, combine the apples, lemon juice, tapioca, 1/2 cup white sugar, brown sugar, cinnamon, and nutmeg, making sure apples are completely coated. 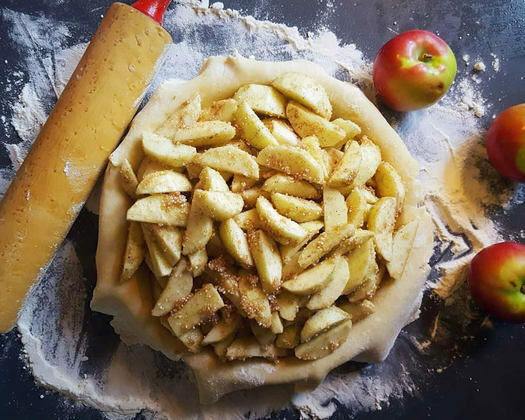 Carefully pour apple mixture into the bottom of the pie crust, then place the small pieces of butter on top of the mixture. Roll out the second half of the pie dough into an 11-inch circle and place over the top of the pie. Trim the top and bottom pie dough so that the overhang beyond the pie plate is only about 1/2 inch. Tuck the dough underneath itself along the edges of the pie plate and crimp together to seal the pie. Cut three 2-inch vent slits in the top dough. Beat the egg with one tablespoon of water to make an egg wash. Brush the egg wash lightly over the top of the pie. Sprinkle the remaining one tablespoon of white sugar over the top of the pie. Cover the edges of the pie with strips of foil to prevent burning. Bake the pie for 30 minutes, then remove the foil, reduce the heat to 350 degrees Fahrenheit, and bake for an additional 25-30 minutes. The pie is done with the crust is golden and the juices are bubbly. Transfer the pie to a wire rack to cool for several hours before serving. Pie can be kept at room temperature for up to three days. Half of a batch of double-crust pie crust dough (you only need a bottom crust). In a bowl, combine the flour, brown sugar, and baking soda for the crumb topping. Cut the butter in with a pastry cutter or your fingers until the mixture resembles coarse crumbs. Stir in the walnuts. Pour over the top of the apples evenly. Cover the top of the pie with strips of foil. Bake the pie for 30 minutes, then remove the foil, reduce the heat to 350 degrees Fahrenheit, and bake for an additional 25-30 minutes. The pie is done with the crust is golden and the juices are bubbly. Need more ideas for using apples? Try these recipes for tarte tatin, savory apple tart, apple slaw, apple wontons, or apple cider donut bread pudding. I'm going to go Dutch for Thanksgiving this year. Any good suggestions for quickly cutting and peeling apples? I know it probably just takes practice, but that's one the biggest deterrents to me making anything with apples, and I'd really love to get good at pie someday. Thank you! @Barbara - I use an old-fashioned vegetable peeler. I like to start at the top and go around, taking off the peel in one, long continuous strip. It's a kind of game to not get too thin or narrow as to break the long strip. Once you practice this, it actually makes fast work of peeling apples. As for cutting, I halve and then quarter them, cut out the core, and cut the chunks one or two more times depending on how thin or thick I want the resulting apple pieces. I honestly think I can prep the apples for a pie in less than 15 min. Barbara, if you're going to do this regularly, it might be worth getting a mechanical apple peeler/corer/slicer like this one. It's sort of like magic that you can buy.